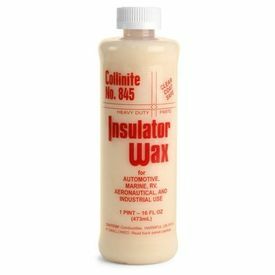 COLLINITE LIQUID INSULATOR WAX 845 16OZ. This heavy-duty liquid wax was originally developed for use by electric power companies for protection against high-voltage power failure, fires and explosions. Its primary use is on the finishes of automobiles, trucks, buses and airplanes where durability, high gloss and lasting protection are paramount. An excellent choice for fleet applications and very easy to use. Requires minimum rubbing or buffing. Clear-coat safe. Collinite Liquid Insulator Wax 845, is one of the finest liquid carnauba waxes you can buy. It has the shine and wetness of carnauba but its longevity is more like a paint sealant. It can provide up to 5 months of protection and incredible water-beading, even on non-garaged vehicles. Liquid Insulator Wax can be applied by hand or using a dual action polisher equipped with a finishing pad. If applying by hand, simply wipe on Liquid Insulator Wax using a poly foam applicator. It takes very little to cover each panel. Buff with a plush microfiber like our Premium 360GSM Microfiber This towel has excellent grip for removing waxes, and it will make application of Insulator Wax even quicker. You will find the wax easiest to remove if you apply a thin coat and do not let it completely haze over before buffing. Collinite Liquid Insulator Wax 845 This heavy-duty liquid wax was originally developed for use by electric power companies for protection against high-voltage power failure, fires and explosions. Its primary use is on the finishes of automobiles, trucks, buses and airplanes where durability, high gloss and lasting protection are paramount. An excellent choice for fleet applications and very easy to use. Requires minimum rubbing or buffing. Clear-coat safe. Collinite Liquid Insulator Wax 845, is one of the finest liquid carnauba waxes you can buy. It has the shine and wetness of carnauba but its longevity is more like a paint sealant. It can provide up to 5 months of protection and incredible water-beading, even on non-garaged vehicles. Liquid Insulator Wax can be applied by hand or using a dual action polisher equipped with a finishing pad. If applying by hand, simply wipe on Liquid Insulator Wax using a poly foam applicator. It takes very little to cover each panel. Buff with a plush microfiber like our Premium 360GSM Microfiber This towel has excellent grip for removing waxes, and it will make application of Insulator Wax even quicker. You will find the wax easiest to remove if you apply a thin coat and do not let it completely haze over before buffing. To apply by machine: work at a low speed with no pressure since you are simply applying a product. Use a microfiber bonnet over a lambswool pad to remove Insulator Wax. Apply wax to one section at a time, wait 30 seconds, and then buff.